My niece is a year and a half old. I was reading a book on animals with her recently and helping her learn the names of the animals in it. I noticed that she identified the picture of a lion as a "kitty". Is it pedagogically better at this point to specifically teach her that it is a lion and not a cat (e.g. 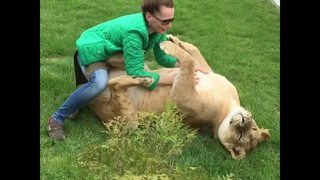 a biological "lie-to-children"), or is it better to reinforce that she is technically correct and then later teach her that a lion is a specific kind of very large cat? I am conflicted as to what the educational best practice would be. I am very well aware that a lion is taxonomically considered to be a kind of cat, but this is not the common street definition of cat, and I am also not convinced that a one and a half year old is expected to understand (or even be capable of understanding) the spectrum of general to specific definitions of words, e.g. that when one uses the word "cat" or "kitty", it typically means only a housecat, but when speaking in terms of biology, it means any animal in the Panthera or Felis genera. Please, no Magritte pipe jokes. Overextension and related phenomena (including the opposite, underextension) are very common, even expected phases in language acquisition. Some children call all four-legged animals "dogs" for a period, while others reject the idea that a chihuahua and a German Shepherd are both "dogs". As a child, I thought that "park" meant only playground equipment. I guess my parents would ask, "Do you want to go to the park?" and I'd think of the only part that was interesting to me at that age. Your niece has a mental concept of what a kitty is, and she's doing the right thing by testing it out on new specimens, even if she has to refine her guesses later. Correction of these usages by parents is not always effective. * All children have to figure out the boundaries of word meanings for themselves. This happens through trial and exposure. — Yes, look at the lion! Isn't he fierce? The child becomes helpfully perplexed about the meaning of your comment and accommodates the new information, either now or later on when she observes that those around her don't say "kitty" when they see that animal. When you say "yes" but use a different word, she's likely to come to the right conclusion: that what she said isn't wrong but it isn't the best or most specific term. Alternatively, there's no harm in directly correcting her. The worst that can happen is that she might ignore or contradict you (for now), and hey, if she's got some metalinguistic gifts she might actually listen and apply what you tell her directly. — That's not a kitty, honey — kitties live in our houses. It's a lion. Isn't he fierce? To put it shortly, don't fret over it. Correct her directly or indirectly, or just let it slide. She will work it out, along with her other inevitable grammar mistakes, as she grows up. — Child: Want other one spoon, Daddy. — Father: You mean, you want the other spoon. — Child: Yes, I want other one spoon, please, Daddy. — Father: Can you say "the other spoon"? — Child: Other... one... spoon. — Child: Other... spoon. Now give me other one spoon? At most ages your best bet is to agree that it is a kitty, as they are the same - but stress that it is a big kitty; the lion kind of kitty. It is a much more positive learning experience to be able to say "Yes" with some clarifications, rather than "No." 18 months is a bit on the young side of understanding, but if she can see that it is a kitty then she will probably be able to see the differences. If you have a book with a cat and a lion in it you can help them see the differences. You can also do the "meeow" and "ROOAAARRR" noises to help them understand. Consider, for a moment, that what she is pointing to is not actually a lion, but a flat sheet of processed tree pulp painted with thousands of little dots in the image of a lion. Her decision to call it a "kitty" comes from her brain trying to find the best way to communicate with you that she can, in the way she thinks you want to communicate. If you want to think it though, yourself, consider how a child must accommodate your new information. If you say "this is a lion," that does not conflict with them saying "That's a kitty." It's not until you add the idea that "a lion is not a kitty" that there is any conflict. If a child is permitted to make any associations they please, and are simply given new associations, it will almost certainly lead them towards wanting to make more associations. I've never seen it fail in my experience. As a general rule, we tend to want this behavior in children (your mileage may vary). Thus, it is generally preferable to avoid giving them negative associations ("this is not a kitty"). From personal experience, my 2 year old called the lions and tigers at the zoo "kitties" from a very young age. All I ever did was tell her "Those are lions!" and "Those are tigers!" By 2, she now properly identifies lions and tigers without hesitation. This, of course, is a general statement, not an overarching one. There are obviously times where we want children to be careful when making associations. We don't want our children shouting "fire!" at anything orange and yellowish, because doing so has social implications. In such cases, negative associations are desirable to nip that behavior in the bud. All practical situations are somewhere in-between, but I would argue that misidentifying an animal in a book is not one which has enough social costs to warrant anything negative. Save it for where it counts. Of course, I may be wrong. Each child is different. Consider asking her parents how they would like you to treat such situations. A million internet kibitzers are probably worth less than simply asking the parent how they would like such linguistic games to be played. If the picture shows a dog are you going to debate if it is a greyhound, a dachshund, or a german sheperd? Just say, "Yes! That is a kind of cat." Many kids barely say a few words at the age one and half so it's nice she's able to identify stuff and put them in words. At her age, she doesn't need to know biological families and subspecies. A lion's pic looks different from a cat's pic, that's all she needs to know. So I would correct her. And then show her a picture of a household cat/kitty and let her figure out the differences between them. Depth of Knowledge also referred to as D.O.K., is the complexity or depth of understanding required to answer or explain an assessment related item or a classroom activity. The concept of depth of knowledge was developed through research by Norman L. Webb in the late 1990’s. A toddler can not reach to that depth of biological knowledge. When you explain of being a lion a specific kind of very large cat, toddler won't be able to grasp. When your toddler tell this to his friends, they won't understand as knowledge is too abstract in their respective depth of understanding. This will arise a chain question of how lion is a big kitty, then what are other categories, then how such categories defined etc. All the above knowledge may not understand by toddler at this level. Even if you make him understand anyhow, it has very less chance that toddler will be able to explain what he knows. 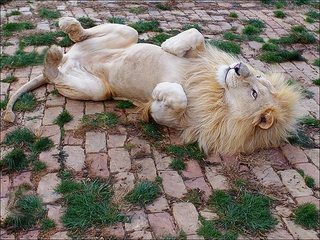 For now you can simply say that lion is a lion, not kitty. This will make toddler more focused and can explain what he knows. But in his age group, he might not be able to explain why a lion is a big kitty when everyone is his age group knows nothing about biological sciences. It happened with me when I was a little boy. I saw an explanation of fishes having an air bladder. When I told this about my friend, they were laughing. They asked how an air bladder can exist in fishes when they are always in water. I wasn't able to explain and got myself in embarrassing situation. I don't want any other boy become like me. I'd tell her it's a lion, and that it's "like a cat" or (better) "a sort of cat". Not the answer you're looking for? Browse other questions tagged toddler education language-development language or ask your own question. How do you encourage a toddler that you suspect may be gifted? How to encourage toddler to not throw food? My two year old has a lisp. Should I try to correct her now? How to help a child not be afraid to struggle with things that are easy for her older brother? At what age we should tell our toddler to not kiss everyone who asks her to? How to encourage a 2 year old toddler to complete colouring a sketch?